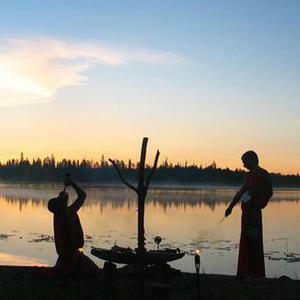 Halo Manash is a ritual ambient project from Finland, formed in 1998, combining electronics, percussions, e-bowed guitars, bone flute and various other sounds into an intense, organic whole. Halo Manash is part of the "helixes" musical collective, and project member Antti Haapapuro is also a member of Dolorian and I.corax. Halo Manash project appeared, found his form and began to cast a shadow in the late '90s in Finland, calling himself the music of nature. Halo Manash is part of the "helixes" musical collective, and project member Antti Haapapuro is also a member of Dolorian and I.corax. Halo Manash project appeared, found his form and began to cast a shadow in the late '90s in Finland, calling himself the music of nature. Sound and video are born from the primary experience, such as the experience of death and rebirth, like getting to the highest peak and fall into the deepest abyss. And this experience is objectified in the form of music, videos, images and artifacts. Use as the source of the organic nature of the object (eg, bone and horn), various traditional and homemade instruments, along with the sounds of nature as such, gives rise to a single sound space. Each performance of Halo Manash - a unique space-time action, at its heart is a process of creation and destruction, something more than just a repetition of the work done already. Halo Manash seeks to go beyond the usual meaning of live music concert by increasing the depth and versatility of penetration into the experience of being both for the audience and for himself. Halo Manash is an entity drawing its life-force from beyond all limitations. It is a means through which we communicate, a vehicle for bridging the worlds of being and non-being, for journeying to the depths and heights. It is a call ? a symbol ever-present and thus not bound by limits of time and space. Halo Manash signifies both the one and the many at the same time: the abstract and the concrete, the hidden and the revealed... the ever-flowing; evolution, expansion, the cyclic yet progressive continuity. It is the aim of the personnel involved in Halo Manash to seek, explore, experience, study and decipher reflections of the ever-shifting shapes and spaces of different worlds. These findings are presented through elemental music and various visual elements. In Halo Manash, sound and movement come together as rhythmical language that facilitates communion with elemental beings. Our aim is to revitalise one of the oldest subconscious forms of communication, to open the gates with the aid of music and widen the horizon of perception concerning states of otherness lying in-between the cardinal directions.